These are average temperatures at an elevation of 4,538 feet. Temperatures will drop at higher elevations. When packing your gear, keep in mind it is being packed out on a mule and our animal’s comfort is very important to us. By following these guidelines you can help us ensure that we’re taking care of all our animals. What to pack your gear into: You must pack your gear in soft-sided, cloth or nylon bag. It can not have any hard edges, frames or wheels. Your gear is restricted to a total maximum weight of 30 lbs (sleeping bag and your luggage). If you do not have a water-resistant bag, it is a good idea to line the inside with garbage bags in the event of rain. You may pack your sleeping bag separately from your other gear. Saddlebags, rain gear and other essentials that you will need during the day (camera, sunscreen, bug spray, lip balm, extra sweater, water bottle, etc) that you are taking on your horse with you are not included in the 30lb weight restriction. A warm sleeping bag: We recommend a bag rated to -15 degrees Celsius or 5 degrees Fahrenheit. You may not need it, but it sure comes in handy if you do. A favourite cowboy trick for extra warmth is to tuck a flannel sheet or non-bulky blanket inside your sleeping bag. No need to bring a sleeping mat, thermarests are provided. Warm layered clothing: A warm coat is essential to ward off chilly nights or a windy day. Also bring a heavy sweater (wool is a great insulator) or fleece jacket. Clothing that is easily layered works the best. You can always remove what you don’t need, but you still have it just in case. Also, bring your most comfortable gear — this is not the time to break-in new boots or a new hat. Jeans: a cowboy classic. Also important is a pair of long underwear for chilly nights. Sneakers: or an extra pair of shoes for wearing around camp, an extra pair of DRY socks is also recommended. Toiletries: towel, facecloth, biodegradable shampoo, toothbrush, toothpaste, disposable razors, etc. Please note that we do not have any electricity at the camps. WE SUPPLY TOILET PAPER AND HAND SOAP AT ALL CAMPS. Hat: A cowboy hat offers the most protection from the elements. Baseball caps or canvas-type hats are also fine. Please ensure that your hat fits snug or ties on and will not blow off in the wind. Chin straps are recommended. If you prefer to wear a riding helmet, we have them available upon check in. 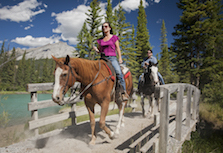 Please note that riders that are 17 years and under are required to wear a helmet while on horseback on the backcountry trips. Gloves: Lined leather or suede gloves provide protection from the elements and a sure grip on the reins (bring two pairs just in case one gets wet). Sunscreen: Plus sunglasses and mosquito repellent. Your camera: Please note that we suggest bringing solar or back up batteries. Please do not bring liquor: Our camps are licensed and offer a small selection of beer and wine for sale, please do not bring your own liquor. Cellular phones: do not work in the areas you’ll be riding in so leave them somewhere safe. If you will be using the camera on your phone, please note that we suggest bringing solar or back up batteries. There is radio communication in case of emergencies. Water bottle: for refreshment while you are riding. You will be able to refill your water bottle at each camp. Saddlebags: You are welcome to bring your own; or we do have saddlebags available at check in. Please fill them with only those essential items that you would need during the day, such as lip balm, your camera, sunscreen, etc. We reserve the right to limit the amount of gear in the saddlebags for weight. Daypacks, backpacks or other bags are NOT allowed — they are hard on your back and hard on the horse’s back, and do not tie properly to the saddle. Equipment Rental: Email Bactrax/Snowtips at snowtips@telusplanet.net, for information regarding sleeping bags/liners, luggage bags etc. Located at 225 Bear Street (just a block away from Banff Trail Riders), Snowtips offers a convenient rental service. They are open from 8am until 8pm, and would love to receive your inquiries. If you would prefer to contact them by telephone, they can be reached at (403) 762-8177, or fax at (403) 760-6289.